The Reyland Sport 280 rear brake conversion features two-piece 280x10mm rotors assembled onto our cnc machined anodised aluminium bells. This kit simply replaces the OE one piece disc. Not only do they look great but they are 0.6kg lighter than the OE disc. 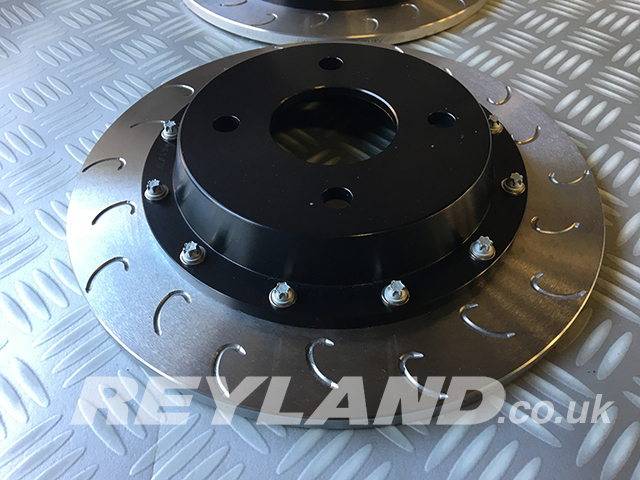 New to our range, the Reyland Sport 330 rear brake conversion features two-piece 330x10mm rotors assembled onto our cnc machined anodised aluminium bells. Supplied with CNC machined alloy caliper relocation brackets and fixings. This kit uses the original caliper (and pad type) which is moved outwards with the bracket. This kit is designed to complement larger front kits whilst retaining the OE caliper. 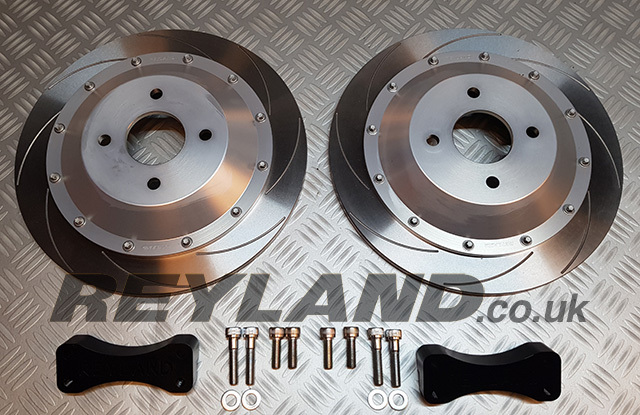 The Reyland Sport 325 rear brake conversion features alloy bodied calipers, two-piece 325x20mm vented rotors, Reyland billet alloy cnc machined mounting brackets and bells. The kit is supplied with all required parts including discs, pads, AP racing disc to bell bolts, brackets, braided brake hoses and unions. This kit is fully MOT compliant as the calipers have cable operated handbrake mechanism built in that simply hooks up to your existing handbrake cables. Pictures show 5 stud bells, this kit is supplied with the correct 4 stud version. Alternative pad makes/compounds available at extra cost. Direct bolt on fit, uses original handbrake cables.